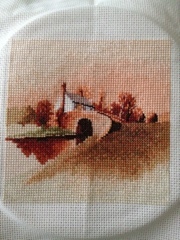 Just finished Lock Keepers Cottage. I'm really proud I finished it so quickly! Now it just needs washing, ironing an framing! It will be awesome, when it has the finishing touches... I hope!